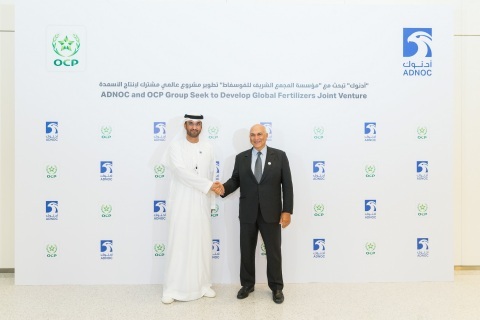 The Abu Dhabi National Oil Company (ADNOC) and OCP Group of Morocco (OCP) have agreed to explore the phased creation of a new global fertilizers joint venture, in a move that will accelerate the execution of both ADNOC and OCP’s international strategies. The proposed joint venture will build on both companies’ competitive advantages, namely ADNOC’s world-scale sulphur production, ammonia and gas expertise, and shipping and logistics network, and OCP’s access to large phosphate resources, its century-long fertilizers know-how and its marketing network, to develop a new global fertilizers producer. The proposed partnership will comprise two fertilizer production hubs, one in the UAE and one in Morocco (utilizing both existing and new assets), giving the proposed joint venture global market reach. This proposed project extends the partnership already established through the existing long-term sulphur offtake agreement that was announced by the two firms in December 2017. The two companies will work on developing capabilities that will support this venture, as they expand their partnership, leveraging their respective strengths and building their human capital. The agreement aligns with ADNOC’s announced plans to increase production by at least 50% from its current levels of 7 million tons a year, as it looks to increase gas production by tapping into vast gas caps and scaling up sour gas production. OCP has engaged in a large-scale development program that will enable it to capture its fair share of growing demand for fertilizers. The first phase of this program was completed this year and has brought the Group’s existing fertilizer capacity to 12 million tons, and rock export capacity to over 18 million tons. Commenting on the agreement, H.E. Dr. Sultan Ahmed Al Jaber, UAE Minister of State and ADNOC Group CEO, said: “The proposed joint venture with OCP Group illustrates ADNOC’s intent to maximize the value of all our resources, as we grow our downstream business, diversify our product range and increase revenues. The agreement builds on the expanded partnership model we announced last year, as we open our entire value chain to reliable, value-adding, long-term partners, who can complement our capabilities and resources, and enhance our market access. The agreement comes as ADNOC, at its Downstream Investment Forum, unveils its ambition and plans to become a global downstream leader, enabling it to further stretch the value of every barrel it produces to the benefit of ADNOC, its partners and the UAE. It aligns with ADNOC’s 2030 strategy of a more profitable upstream, more valuable downstream, more sustainable and economic gas supply, and more proactive, adaptive marketing and trading. This project further supports ADNOC’s downstream growth plans to create the world’s largest integrated refining and petrochemicals complex in Ruwais. ADNOC’s Downstream Investment Forum gathered, in Abu Dhabi, over 40 global CEOs and more than 800 senior global business leaders from diverse industry sectors. At the Forum, ADNOC partners, stakeholders, customers and suppliers heard details about the company’s new downstream growth plans as well as new partnership and investment opportunities available across the expanded ADNOC value chain, as it seeks to redefine and transform its downstream business.